2 – 3hr kayak and canoe swamp tour through the historic Manchac swamp. Very little experience is necessary to paddle the slow-moving bayou that once was home to the destroyed logging ghost town of Ruddock, LA and served as a passage way for historic New Orleans explorers; Iberville, Biennville, and more. You can be picked up at the historic St. Roch Market right outside of the French Quarter or drive yourself the short 30 min drive to the tour location. The group will convene at the trip starting point and an introductory lecture on kayaking the swamp will be given. 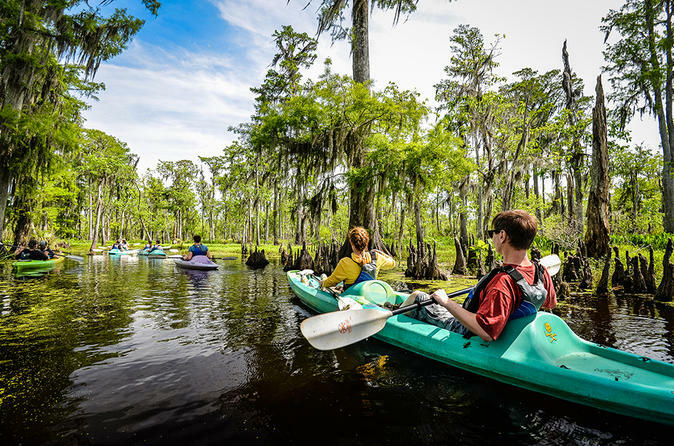 You will then enter your kayak and follow your guide through the scenic Manchac Swamp, a slow-moving bayou that once was home to the destroyed logging ghost town of Ruddock, LA and served as a passage way for historic New Orleans explorers; Iberville, Biennville, and more. Stops will be made along the way and your guide will teach you about the swamp's history and wildlife. The tour duration is anywhere from 2-3hrs depending on the groups kayaking experience. Once you return to the launch site you will join the rest of the group to be transported back to the city. If you drive out yourself you can depart as soon as you return to the launch site.